Af Klint’s work predates the earliest thought-of abstract painters such as Mondrian, Kandinsky, and Malevich. Beginning her studies at the Royal Academy of Fine Arts in her 20’s, she graduated in 1887 and began working in abstraction in 1906. Though she became an established and respected painter in Stockholm, she kept her works private for most of her life. In fact, she stipulated that her groundbreaking paintings be concealed until 20 years after her death because she was convinced that the world would not understand them. Her first and largest group of work is The Paintings for the Temple, which the Guggenheim showed in full. The concept behind these works came from séances that af Klint held with four other women (they referred to themselves as De Fem, or “The Five”), where they participated in automatic drawings and channeled spiritual guides. As a young woman, she became deeply involved in spirituality and theology. Af Klint was told that she would be the one to complete the task of creating a series of paintings for a spiral temple that would be built specifically to hold these paintings. Using scientific, geometric, spiritual, and theological imagery, af Klint created a total of 193 paintings for the temple, however, this temple was never created. One of the major subgroupings in The Paintings for the Temple that af Klint created is The Ten Largest. “The cycle focuses on the stages of life and humanity’s connections to the universe,” writes curator Tracey Bashkoff of these works. “The mix of floral, geometric, and biomorphic forms with letters and invented words creates a vocabulary of complex and shifting meanings, with which af Klint herself appears to have grappled. In these works a plant tendril may become a spiral, which in turn unfolds into a coiling line that then scribes a calligraphic letter—codes and words from an unknown language. 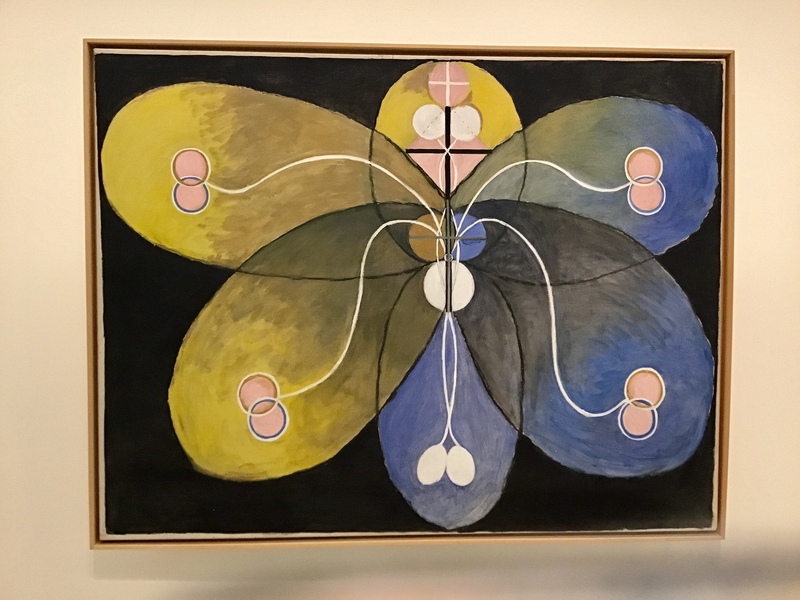 Two pulsing orbs are, at the same time, microscopic eggs and intersecting solar systems.” Af Klint seemed to have been thinking about the world in a holistic, inter-connective way. Creating two Childhood, two Youth, four Adulthood, and two Old Age, af Klint depicted her view of the aging process. The color choices begin with very bright and bold colors that get paler as af Klint moved towards Old Age, which resonates with associations people often have with each state of life. As a visitor enters the museum exhibit, a gallery filled with this subgroup is the first one seen. In terms of placement of the pieces, choosing the entrance was a good move because these pieces create a warm, welcoming atmosphere and introduce the visitor to af Klint in a striking and notable way. As earlier mentioned, af Klint became invested in spiritualism and participated in movements that merged Eastern, Western, and occult beliefs and did not consider science and religion to be distinctly separate entities. Her spirituality enabled her to create the momentous series known as The Paintings for the Temple. Each subgroup evolved as she worked diligently for nine years 1906-1915) to generate such an elaborate grouping. From biological motifs to naturalistic imagery, af Klint touched on a myriad of styles and compositions, which manifested in this magnificent, cumulative work. Lastly, at the end of the exhibition, the museum presented R. H. Quaytman: + ×, Chapter 34. Quaytman had had an interest in af Klint’s work since 1989 when he arranged for a small exhibition on her work at New York’s P.S.1 Contemporary Art Center. Quaytman created paintings that engaged af Klint’s aesthetic language and subject matter in a way that examined them through the lens of the Guggenheim Museum’s founding ethos. Quaytman noted in the catalogue, “If you . . . didn’t know anything, you’d think these paintings were made ten or twenty years ago. You would not know how old they were. And what’s so thrilling about her work, I find, is how contemporary it feels.” That about sums up the feeling that af Klint’s work has created for so many of her admirers. This show will be up until April 23rd, 2019.